According to Consumer Reports' March 2012 web article "Bathroom remodeling guide: Trends and Costs," the average cost of a 35-40 square foot bathroom is about $16,000. We spent within our material budget of $2,500 for new walls, new flooring, and all new tile and fixtures in our 40 square foot apartment bathroom. Today, I'm focusing on how you can Crunch the Alternatives to stay within a budget you can afford. 2. Crunch the Alternatives: Consider other options and calculate the cost of each. When I spoke about choosing permanent fixtures to splurge on first, I introduced the foundation of our bathroom design: an $800 shower kit from The Home Depot. As I mentioned, my husband and I decided on black tile in our bathroom, so we quickly started to consider our options with this shower. We discussed: "What if we skip the shower wall, and install the shower door and base with a tile wall?" At $5.40 per tile x covering 36 square feet, a tiled shower wall would cost: $194. That's a savings of $100 in material, AND we would have a black granite shower wall, just what we wanted. We crunched the numbers for just one alternative, the option we preferred, and saw savings. So now, our decision helped us have a $700 shower, which also is a permanent featured fixture in our bathroom. Consider making a list of what you really want in your space, and brainstorm what could be switched and how much the switch will cost. Note that sometimes this will not end up in savings. It's almost like figuring opportunity cost, in a way. Like asking: What is the value of switching an iced coffee for a soda in a meal package, and is it worth it? Or, is 10 cents more worthwhile to spend to receive 20% more beverage? Adding up our splurge items roughly, with crunched alternatives, our bathroom budget started to look like this: $700 + $300 + $400 = spend at least $1,400 for our preferred bathroom. 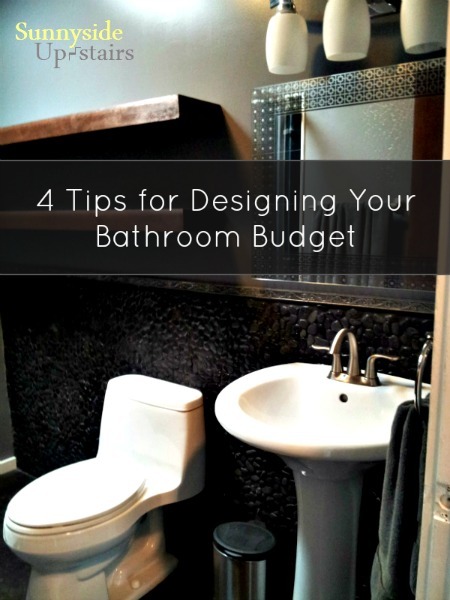 Your budget is much more in line for us than the average budget, so I'm totally loving these tips! This alternative with the tile wall instead of the shower wall insert that you didn't like is creative and you got what you wanted. Very nice! I love your blog! I can basically remodel without dishing out too much moola. Thanks for the tips and tricks! Your alternative does look better than the original selection, and saved $100 too. That's what I call a great alternative! The numbers breakdown for each step is helpful too. This is a great tip! =D The shower example was the most surprising to me in the bathroom remodel. It's something I did regularly throughout choosing fixtures in our apartment, but also when I build my rudimentary furniture. Someone told me a few months back to buy a dining table at a big box store. "It's only $100," they said. =D It was like a challenge to see if I could make our own alternative that was cheaper.